Danny Peterson | 11/20/2018, 3:03 p.m. Dozens of supporters and civil rights activists attended the Nov. 14 installation and dedication ceremony led by Urban League of Portland President and Chief Executive Officer Nkenge Harmon Johnson. The Portland Bureau of Transportation and the community non-profit Southeast Portland Uplift were co-sponsors of the event. Members of Seraw’s family and the city’s Ethiopian community also attended. 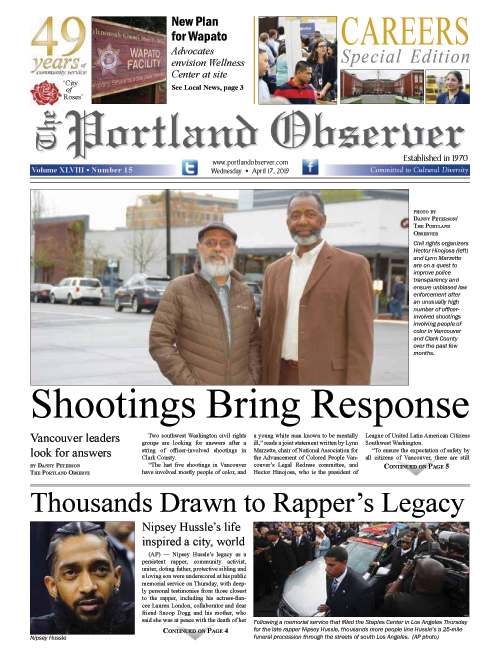 Mulugeta Seraw had moved to Portland to attend college when he was killed. Johnson referred to the horrific attack in her remarks. She also took aim at a new modern white supremacist movement which signals that the fight against racism is not over. "Our eyes are wide open," Johnson said. "We know that the Patriot Prayer boys, the Proud Boys, the white nationalists, and those other hoodlums who seek to make us unsafe, want to bring us back to 30 years ago when Mulugeta was beaten on these streets by those thugs. Now there are folks who want to bring us back to that. But look at all of you here today." The unveiling of 16 street sign toppers between Burnside and Stark streets brings a permanent place of honor with Seraw’s name before the public in English and Amharic, Ethiopia’s official language, and listing his years of birth and death. In Seraw’s death, three skinheads admitted to killing him because of his race, part of a group called East Side White Pride. They pleaded guilty to the 1988 slaying and were sent to prison. The criminal prosecution later became the basis for a successful 1990 Southern Poverty Law Center civil lawsuit filed in Oregon against California white supremacist Tom Metzger. A Grand Wizard of the Ku Klux Klan in the 1970s, Metzger founded the White Aryan Resistance in the 1980s. He was found liable of Seraw’s death based on the killers’ associations with Metzger’s group. Today, racist groups are actively recruiting in the Pacific Northwest and have contributed to an escalation of violence at political rallies. Documents revealed just this week show that the FBI has provided an assessment to the Clark County Sheriff’s Office that the Proud Boys, a band whose members have appeared at right-wing rallies in Portland and Vancouver and have been involved in street fights with counter protestors, have been designated an extremist group with ties to white nationalism. The Southern Poverty Law Center had previously listed the Proud Boys as a hate group.